Zoya Aria from the summer 2010 Sirens Collection. This is a deep pink jelly with silver (and gold?) glitter. It almost looks like a glitter sandwich without the work of layering. I enjoyed this color a lot. I got several compliments. It's just a classy looking lady like princess-y pink. 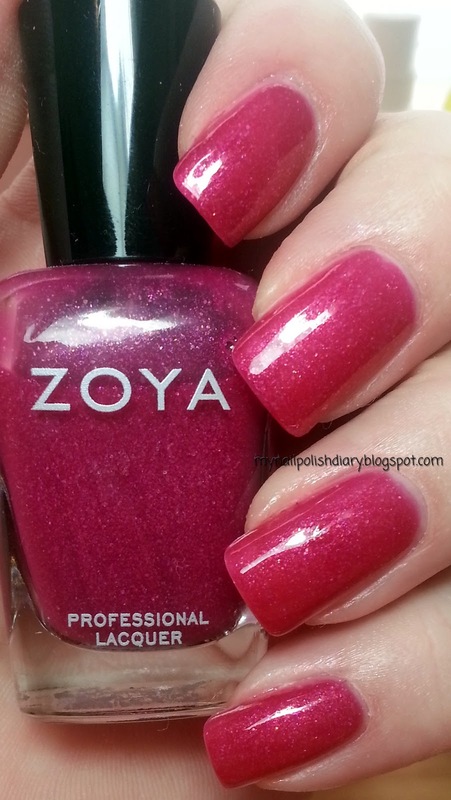 Diva glam ;) Zoya is such a fantastic company. They have all kinds of promotional sales, sometimes free shipping and often BOGO. They are the bomb.com If you don't happen to have a Zoya account let me give you a little bit of wonderful news. You can use this link to Zoya and create an account. If you create an account you will get a free bottle of polish. If you add two more colors, for a total of three polishes you will also get free shipping. Free polish, free shipping. People! This is a win win situation. Also, if you use that link I'll get a few points to get some free shipping on an order as well. We all win :) So go check out Zoya if you've never been there. Thank you Liesl. You're right, Zoya is the bomb.com!